Nyonya loves pickled vegetables of all kinds. So, there is no surprise that my family in Penang is partial to pickled or preserved foods—vegetables, fish stomach (perut ikan), and cincaluk (preserved baby shrimp). Grandmother was a huge fan of pickled Nyonya dishes. I grew up watching her and my aunt making lots of acar (also called acar awak) or pickled mixed vegetables in a spicy and sour “pickle” sauce. My aunt who in her 70’s now still makes acar religiously for celebrations or prayers to our ancestors. After I told her on the phone that I launched a Nyonya food blog, she made a big serving of acar for the purpose of this blog. Because of the appetizing, sour and spicy great taste, acar is always a popular and high-demand “commodity” in my family. Here is my aunt’s recipe for acar (acar awak). Do try it out as Nyonya pickles offer layers of flavors unlike other pickles. Just the color alone is enough to set my stomach rumbling and mouth watering. 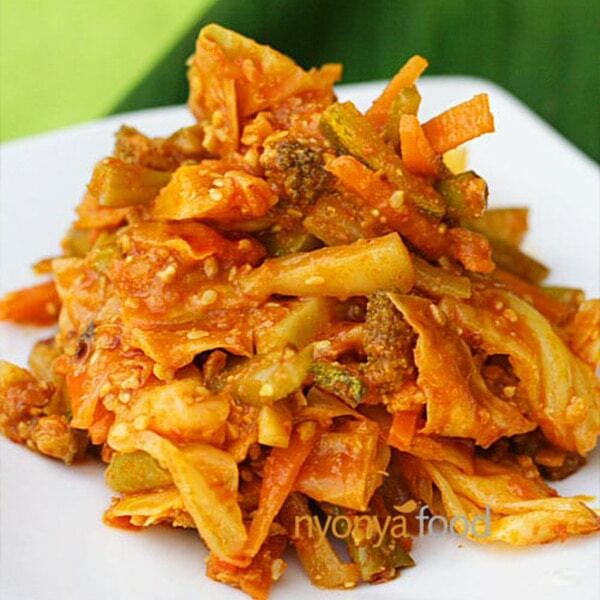 Acar Awak Recipe (Nyonya Spicy Mixed Vegetable Pickle). Soak the tamarind pulp in water for 15 minutes. Squeeze and extract the juice and set aside. Blend the spice paste in a food processor and set aside. Heat up a wok and add oil. Stir-fry the spice paste until aromatic. Add tamarind juice and bring to boil. Add salt and sugar to taste. Add all vegetables into the wok and turn off the fire immediately. Add ground peanut, stir to mix well. Dish out, let cool and serve. Acar is best served overnight. You can keep acar in the refrigerator for a few days. Is there a replacement for the candlenuts? I hate to buy something for just one recipe. . .
You can replace candle nuts with macadamian nuts. I hear that candlenuts are toxic until cooked. Is this true? I have tamarind paste, not the pulp. How much should I use for this recipe? Add it slowly, depending on your taste. Do you have to blanch the long/french beans? I tried your recipe and the beans tasted too raw. Thanks for the detailed recipe and the mouth-watering pictures; the food looks pretty good, too. The recipe mentions 1 cup of water. How much liquid is generated by squeezing the tamarind? Does the total amount of tamarind juice/water come to 1 cup? I’m just trying to figure out how much liquid needs to be added to the spices. Hi I was wondering how many acar awak serving for this recipe? I thought that the vegetables have to be scalded first in boiling water. Your recipe does not say so. Add all vegetables into the wok and turn off the fire immediately, that’s when you cook the vegetables. You don’t want to overcook the vegetables they should have a crunch and fresh.